Occasionally in our lives there is an alignment of powerful forces that cause a technology, a theory, or a new product to resonate with the broadest of audiences. One topic that is consistently debated and the highest priority on the agenda of citizens, public servants, and nations at large is healthcare ---and in particular how the advent of the internet and communication technologies is changing the way we deliver care. The aim of Information and Communication Technologies (ICT) for Health (also known as eHealth) is to significantly improve the quality, access and efficacy of healthcare. ICT for Health describes the application of information and communication technologies across the whole range of functions that affect the health sector. Whether attempting to heighten prevention, detection, integration, or extend patients self-management tools---today’s healthcare delivery paradigm is clearly shifting to focus on connecting individuals rather than infrastructure. Moreover, today’s savvy consumers are demanding better health services and a more personalized service delivery model that places them at the centre of new models of connectivity for improved communication and collaboration. Harris Interactive, on behalf of The Commonwealth Fund Commission, recently surveyed a random sample of 1,004 U.S. adults (age 18 and older) to determine their experiences and perspectives on the organization of the US health care system and ways to improve patient care. Eight of 10 respondents agreed that the health system needs either fundamental change or complete rebuilding—citing difficulties accessing care, poor coordination of services, and administrative hassles. In addition, the survey found that one of three adults has experienced inefficient or unnecessary care in the past two years. 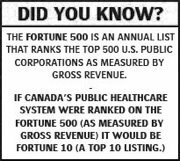 Granted this was not a Canadian study, however, many of the systemic issues seen south of the border are equally relevant here in Canada. What is consistent in both countries is that Patients are increasingly seeking services that empower them to take an active role in managing their own health. Empowering patients to take more control over their health extends to those actions individuals and take for themselves, their children, families and others to stay fit and maintain good physical and mental health; meet social and psychological needs; prevent illness or accidents; care for minor ailments and long-term conditions; and maintain health and well being after an acute illness or discharge from hospital. 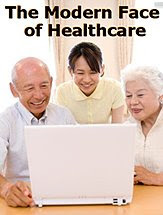 Patient self-care is driven by things like the increased adoption of online services via broadband and mobile devices; the enhanced ability to connect with individuals in other social networks; the continuing ease in submitting content online; and the growing participation of users with similar interests in online communities. What is clear is that people are going online today to share personal health experiences and learn from others with similar experiences or conditions. This shift promises to evolve traditional models of medicine toward a patient-centric model and aims to effectively bridge the gap between caregivers and patients – before, during, and after the hospital stay. The good news is that the value proposition is mutually advantageous, as both Patients and Healthcare delivery organizations reap the benefits of self-care initiatives. There is a notable growth in patient collaboration in determining support and direction. And this will only increase as the tools that enable and track insight and participation continue to improve. When patients participate directly in determining how they are engaged, and are provided personalized content in their preferred channel, Healthcare delivery organizations are simultaneously extended the ability to capture and share information, understand their stakeholder’s unique needs, and improve the overall patient experience. Information and communication technologies (ICT) offer numerous potential benefits in terms of improvements for patients, health and elderly care professionals and decision-makers. Citizens, patients and relatives must have quick, trouble-free access to quality-assured information on health care provision and health concerns, as well as personal data on their own care, treatment and health status. They must also be able to contact care services via the internet for assistance, advice or help with self-treatment. What is absolutely clear is that Information and communication technologies are changing health care delivery and are at the core of effective, responsive health systems. These technologies are key to connecting people, information and research to improve health in countries, and ultimately, healthcare organizations extending their patients participatory tools in their own care path will have a much deeper understanding of their patients needs, and will have gone significantly farther towards building and maintaining patient trust and confidence. Today, it’s truly all about the Patient and one-to-one engagement is the new competitive advantage. Thought Leader Series | "Patient Portals"
According to the Deloitte 2008 Survey of Health Care Consumers, over 70 percent of consumers want their hospital to provide online access to an integrated view of their medical information, including test results, doctor visits and hospital stays. Yet the percentage of hospitals that have deployed a true patient portal is still in the single digits. Although it may appear that the healthcare industry has been devoid of motivation for the past 10 years, hospitals have been investing heavily in technology such as hospital information systems, laboratory systems, picture archiving computer systems and other solutions that enable electronic connectivity for clinicians within the organizations. These investments are already beginning to show results in terms of productivity and cost savings. However, this is just the start of the process of patient data integration. Even though some hospitals have successfully linked major disparate systems within the hospital, few have fully integrated their environments, such as pharmacy interaction for closed loop medication reconciliation and seamless access to physician practice-based electronic medical records (EMR), the source of the majority of a patient’s encounter history. Connecting to the multitude of EMRs can be a real challenge for hospitals. For example, if there are 1,000 referring doctors in a given area, and approximately 300 different EMR solutions in the industry (depending on who you ask), it is reasonable to assume that a hospital might need to interface with 15 distinct EMRs within just one community. Adding to the complexity is the fact that the average patient sees three to five different providers. This is all compounded by the relative newness of system and interoperability standards, which has erected significant speed bumps for risk-averse hospital systems. Once hospitals link their inpatient hospital systems with outpatient (physician) EMR systems (still a dream for many healthcare systems today), the next step is to extend the network to include patients. Several factors motivate hospitals to accelerate this step. First, the expanding adoption of high-deductible insurance plans by employers is forcing fiscal and care decision making upon consumers. With this increased level of responsibility, consumers are demanding greater transparency in costs and improved value of the care delivered by providers. This is well supported by industry statistics: For example, the Deloitte 2008 Survey of Health Care Consumers shows that 64 percent of consumers wish to use Web sites to research the quality of hospital care, 62 percent wish to verify the prices of hospital services and 59 percent wish to view information about health conditions and treatments. Consumers who are often drafted into the consumer-directed healthcare model through their employers have become empowered patients that expect value for their time and money. As indicated in the Deloitte study, 68 percent are interested in same-day appointments and 60 percent want online appointment scheduling — and they are willing to pay for the convenience. In fact, one in four consumers would pay extra for online access to these integrated services and patient information. As insurer reimbursements continue their downward spiral, this new source of incremental revenue is a strong motivation for providers, as is the competitive advantage that it supplies in the increasingly crowded marketplace. Additionally, hospitals are beginning to realize that the more extensive the integration of actionable patient information and online access, the greater return on investment they experience. Large hospital systems in cities such as Philadelphia, Chicago, Seattle, Detroit and the Washington/Baltimore region are making some of the greatest strides in this area. An interesting development occurred with the entrance of Microsoft and Google into the healthcare arena. Their ubiquitous consumer outreach has introduced the masses to the concept of medical information access at a rate and scope not achievable by a healthcare organization without millions of additional dollars spent in patient communications. Now, EMRs and personal health records are some of the hottest concepts within consumer media, compelling patients to approach their physicians and hospitals to ask for the ability to view and access their medical information and healthcare services. Consumers now know that these services exist — and they want them. This situation is similar to the shake-up that occurred in the travel industry, triggered by the consumer-focused, online services provided by Expedia and similar travel portals. Traditional agencies had to adapt and offer comprehensive online services or be left behind. Google and Microsoft have shaken the healthcare tree, and it’s time to evolve or fall to the ground. 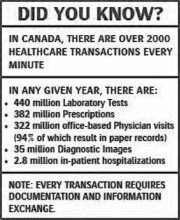 But even those two corporate behemoths are not supplying all of the legs of the patient data stool. They are offering free medical record storage, but with limited integration to all the disparate sources of medical data. Their solutions provide limited benefits related to enhanced clinical workflow and productivity. But they do point the industry to that which it lacks — access combined with actionable data. Unfortunately, some hospital organizations may pause once they provide basic access to data, without providing a means to act upon that data. Patients wish to see their test results, but then they need to schedule a follow-up appointment, ask questions and request prescription refills. This is the actionable functionality that is key to achieving the maximum workflow, quality and safety benefits with these integrated systems. We have seen a 3-to-1 variance when comparing the use of phone-based services to online services. On average, the provider’s staff spends three minutes on the phone scheduling an appointment; yet that same action would take a patient one minute to accomplish via a patient portal, without requiring assistance from hospital personnel. Multiplied across patients, the time savings for both parties is substantial. Additionally, the patient has the convenience of scheduling an appointment whenever they have time, whether it is at 2 a.m. on a weeknight or at 10 a.m. on a Sunday. No wait, no hassle and all the benefits of online services — e-mail reminders, online calendars and more. For clinicians and staff, these online requests can be responded to during non-peak times so that hands-on patient care can be their first priority, contributing to improved patient outcomes and safety. Furthermore, the streamlined workflow enabled by the portal enhances all phases of the continuum of care. Lastly, the satisfaction delivered to the patients, as well as to the clinicians, should not be underestimated. Just like the old-fashioned word of mouth, happy patients will send links to helpful information found on patient portals to their friends, relatives and colleagues. 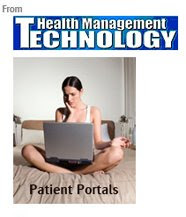 Some portals even enable patients to provide family members with authorized access to their private medical information. Otherwise known as viral marketing, by encouraging patients to forward information about the given hospital’s impressive patient portal services, hospitals have tapped into one of the most powerful and cost-effective marketing methods for attracting future patients. Of course, any change will face some resistance. Similar to traditionalists that prefer to walk inside the bank and stand in line to deposit their checks, there will be some patients that are not immediately comfortable with online interactions. However, soon we will see corner store kiosks where we can view and access our medical records, and communicate with physicians and office staff. It’s already started. Peter Kuhn is President of MEDSEEK, a provider of enterprise eHealth solutions. Hospitals are huge and can be intimidating institutions, not just for the patients, but for a new CEO such as myself. I am quite frankly overwhelmed by the amount of teamwork and collaboration that exists here at Credit Valley and beyond our doors with our health-care partners. This is great news, for if we are to move forward with our quest to deliver patient and family-centred care and to ensure equitable and sustainable access for all, we must forge even stronger relationships. And we’ll do so if we make teamwork, collaboration and partnerships our top priorities. Gone are the days when hospitals competed with one another for scarce financial resources in order to duplicate programs and services at each facility. What’s critical is the idea of mutual respect - within the hospital and broader health-care environment recognizing the significant role each facility, each program and each individual plays in the overall delivery of good patient care. It is critical to maintaining that community connection and understanding as we build and reform the system. The spirit of cooperation has been accelerated through design and demand of the various regional health systems across the country. Even before the formalization of such systems, there have been many informal and spontaneous examples of co-operation among health-care facilities. I’m hugely impressed by these initiatives that often begin at the community and grass-roots level. Here at The Credit Valley Hospital in Mississauga, Ontario, we are working closely with our neighbouring hospitals and other health-care partners to offer our patients more comprehensive and coordinated services, each through our own regional specialities. The patient experience is further improved because in many instances, they no longer have to travel to Toronto or Hamilton or other larger centres for their care, reducing their travel costs and anxiety. In order for this collaboration to work, we have all put new resources into making sure our patients are being informed and navigated appropriately to find the care they need, where and when they need it. It’s not always where they thought they might get it. In fact, it may not even be in a hospital environment. That’s asking a lot of our patients. Doing our best to make the move between facilities and caregivers as seamless and painless as possible is paramount to a good patient and family-centred experience. One way we do that, is through the REACH web portal. The collaboration initially between six physical hospital sites in Peel and Halton regions (Credit Valley, Halton Health Care and William Osler Health Centre) means all of our clinicians have instant access to patient health information stored electronically at any of the hospitals through a secure network called REACH -- Rapid Electronic Access to Clinical Health information. The web connectivity is growing between more hospital sites which will allow even more physicians to access clinical data from disparate systems through one unified view. This allows physicians to easily review their patient’s records, lab results, cardiology images, diagnostic (PACS) images, transcriptions and progress reports. Because the ehealth record shows their patient’s entire health history, important information such as medication allergies will be revealed even if the patient inadvertently forgets to mention the allergy at the time of a visit to any of the health facilities on the REACH network. Within our own four walls at Credit Valley, the team approach to problem solving has made significant improvements toward patient and family-centred care, most recently in our regional cancer centre. Cancer patients have spent seemingly endless time between appointments for tests and treatment in the same building. The Stream Team, made up of oncology doctors and nurses, clerks, lab, pharmacy and information systems with input from staff, patients and volunteers, set out to redefine their patients’ experience. They charted every step, every process, every wasted minute and after several months, they had streamlined ten processes to seven and decreased the patients’ waiting time by almost two hours! Nurses and doctors collaborated on patient assessments; volunteers took on responsibility to ensure patients moved smoothly from one process to the next and now, there’s the potential to see even more patients each day. I believe leadership happens at every level within an organization that values and respects the roles of every individual – not just the caregivers – but the patients and families we are here to serve. I saw that first hand as I worked alongside the men and women cleaning stretchers in our emergency department; as I sat beside the charge nurse who was more like an air traffic controller as she juggled patients, personnel and stretchers throughout her shift. I believe the role of leadership is to create the conditions for success not just in terms of the hospital, the system or even the government. Everything we do, every decision we make, should be prefaced with the question, “what’s best for the patient?” This isn’t easy. It’s takes a sense of respect for everyone at that table and the courage to push the traditional boundaries and norms to embrace innovative solutions. But without that respect, the kind of changes our hospitals need will be too slow for what our patients deserve – and increasingly, demand. Respect, teamwork and collaboration have and will make the difference in elevating patient care. Is that respect there? You bet. Having re-entered the health-care sector, I’m humbled daily by the unbelievable dedication on the part of doctors, nurses, clinicians, and administrators who put their patients first in a system where that isn’t always easy. Michelle DiEmanuele is the President and CEO of the Credit Valley Hospital in Mississauga Ontario.